Owing to our vast industry knowledge, we have been able to wholesale and supply an astonishing range of Ball Thrust Bearings. 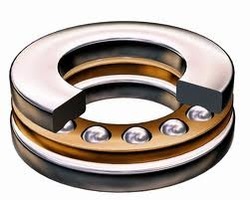 These bearings are designed to hold a high axial load while shifting from parallel to the shaft. In order to deliver a defect-free range at clients' end, we thoroughly test it on respective parameters of quality. The offered bearings are manufactured using high grade raw material and innovative technology in tandem with globally accepted norms of quality. Apart from this, it is made available to the customers in varied specifications at pocket-friendly prices with no hassle.